After a horror show in mid-week against PSG, Manchester United must pick themselves up and make the journey to Stamford Bridge and take on Chelsea in the FA Cup. While United have excellent form going into the game (apart from the PSG result) which have shot them up the table to fourth, Chelsea have had inconsistent form over the last few matches as, although they booked themselves into the Carabao Cup final and won 2-1 away to Malmo, they have suffered defeats to Arsenal (2-0), Bournemouth (4-0) and Manchester City (6-0). Chelsea have very few injuries going into this game with only Ruben Loftus-Cheek a potential doubt due to his persistent back problems. Manchester United on the other hand are without Jesse Lingard and Anthony Martial as well as club-captain, Antonio Valencia and Matteo Darmian who will all be out of the fixture and the trip to Anfield. Both teams have a high degree of quality despite stuttering at different parts of the season and operate best in a 4-3-3 formation. There's never a doubt over De Gea's ability especially when he saved United from a more humbling scoreline against PSG. 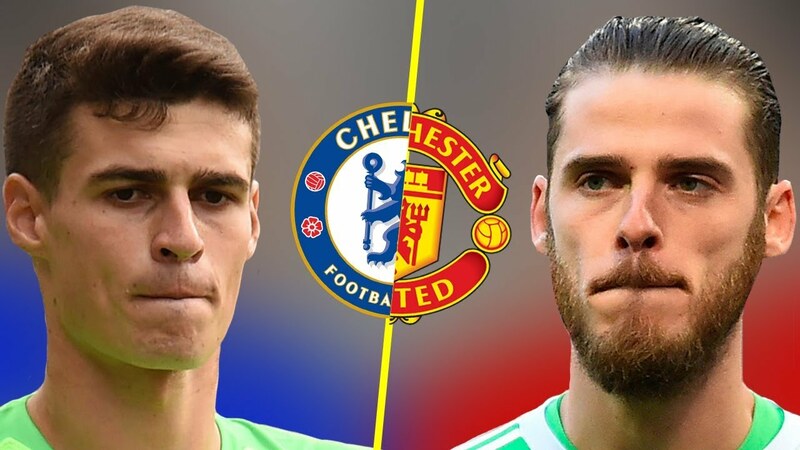 Kepa is a very good goalkeeper and could be the next De Gea and probably one of Chelsea's more underrated players. This game could be a battle of the goalkeepers, especially since the defensive aspect of both teams still seems to be a weakness. While Ashley Young is a relatively consistent and versatile player, I'm not a fan of him as a starting right-back. He was caught out many times against Di Maria and Bernat on Tuesday and honestly, if Mbappe was allowed to play on the right, it could have been worse. Azpilicueta is a fantastic player and a solid defender and when United was linked with him in the 2016 and 2017 summer transfer windows, it could have been one of the best deals under Mourinho's tenure. Victor Lindelof is almost undroppable at the moment and should continue against Chelsea in the fine form he is in. The other defender was more difficult to choose, especially with both teams struggling at the back. Bailly, David Luiz and Rudiger were all options but in the end I chose David Luiz. The Brazilian can sometimes be lazy and sloppy in his defending but, on his day, he is a very good player and was pivotal in Chelsea's title winning season in 2016/17 making incisive through balls and creating attacks from defence as seen with his nine big chances created and two assists this season. I know many Chelsea fans who fume over Marcos Alonso's inclusion in the Chelsea squad sometimes as he struggles to get back and defend at times and although is a good attacking full-back, he is starting to struggle while not as a wingback. Shaw has grown so much this season and is the best left back at the club. He defends with composure but needs to make more surging runs forward and improve his crossing to become the player he was tipped to be. Sarri is wrong. Kante should be playing where he won back-to-back titles, an FA Cup and a World Cup - a holding midfielder. Matic has significantly improved under Solskjaer this season but Kante is a far superior player and should not be sacrificed to play in any other position than a CDM. Pogba is a world class player and that is an easy statement to make, 11 goals and eight assists this season. Matteo Kovacic has been a very good player for Chelsea since being loaned to Stamford Bridge in the summer but Ander Herrera completes a high-pressing midfield that aims to counter-attack with the pace upfront. Martial and Lingard's injuries unfortunately made this an easier decision. 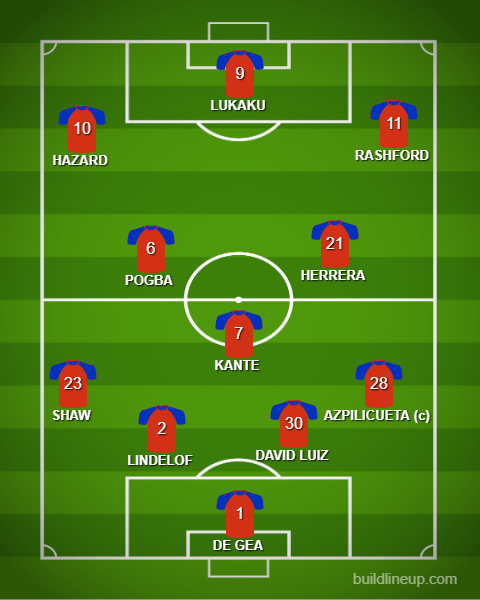 Hazard is another world class player in this combined XI who would be a star player in any squad. Willian is a good player but Marcus Rashford has been outstanding since regaining his confidence. He can play anywhere in an attacking three and could even play as a no.10 as he has done for England in the past and would give any defender a lot of trouble. This was a very difficult decision between two number nines, Lukaku and Higuain. Higuain has not had a lot of time in the Premier League and is notorious for failing to score in the big games. Nevertheless his goalscoring ratio in his career is roughly a goal every two games, scoring 292 goals in 582 appearances. Lukaku made his 400th career appearance against PSG on Tuesday and has scored 180 goals in that time, making his ratio of goals less than the Argentine but still impressive. Both players have struggled this season but have scored or assisted the same number of goals (13) with Lukaku scoring nine and assisting four times and Higuain making it to ten goals and three assists. However the Belgian would link up well with Eden Hazard as he has done in a far more prolific international career than Higuain as part of Belgium's golden generation. I think it is too soon to determine how well Higuain can cope with English football and perhaps Monday's game could revitalise a confidence-shot Lukaku who is set to start.